We're going to meet you soon and can't wait. Hopefully over Thanksgiving we'll get your room set up, and get ready for your baby shower! December is going to be a month of childbirth classes, it seems. I feel like I'm running out of time, but really...I've got time. I don't need to have *everything* done before you get here although my crazy neurotic side wants it all done....yesterday. Average size: 15.2-16.7 inches, 2.5-3.8 lb. Weight gain: I'm doing better at gaining more slowly. I think the vitamin D is keeping me awake so I can move more, and I'm having less cravings. Movement: You move a lot. You're not kicking so much anymore as much as flipping around. It feels pretty awesome, but sometimes...sorta painful. You had some fun hiccups yesterday though. How I'm Changing: I'm looking more and more pregnant. I'm getting settled into the idea of being mom. I can't wait to meet you. 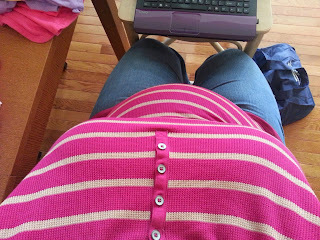 Maternity Clothes: I'm loving my maternity shirts. They're awesome and long. I pretty much layer everything. I like the tummy support in maternity pants, but they aren't really comfortable for long periods of time, so I generally wear them out and immediately change back into jeans when I get home. How I'm Feeling: Pretty good. I have ups and downs. I had a really good day on Saturday when we went to IKEA. Sleep: I'm getting up more at night, but I'm dealing with shorter bouts of sleep better, as long as dad doesn't snore the entire night, and keep me awake. What I miss: umm...flexibility? I'm noticing that I can't do things like cross my legs anymore (that that I was doing it much before). What I'm Eating: Turkey!! We had a fakesgiving with our friends last night. Lots of turkey was involved. Cravings: I love cheese on water crackers with cran-apple butter. It's not a craving...it just makes me happy. I have none of those weird cravings for fried food that I was having earlier. Best Moment this week: Yesterday's Fakesgiving was fun. With you though...the other night, dad really felt you roll around and kick. I love it every single time this happens. We also had a most excellent visit to IKEA, and although the purpose of the visit wasn't to buy things for you...I might have picked some things up for you, and taking pictures of dad doing silly things. 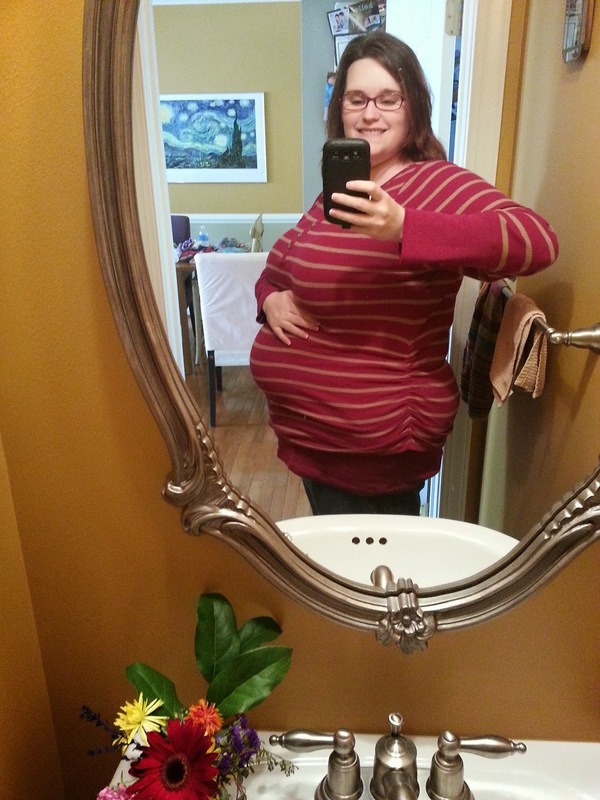 Here's my obligatory selfie, since seeing my belly grow is the real reason you're here. I feel like it's getting bigger daily, and my ribs are totally spreading.